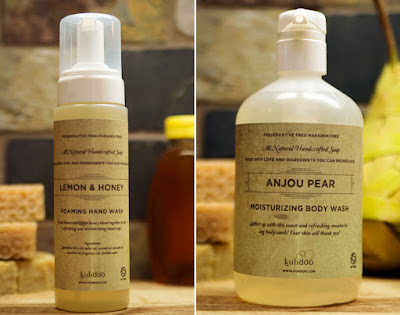 Annie's Artist Lookbook: Kuhdoo Soap Co.
Fun Family "Factory" of Soap Makers Sharing Small Batch Amazing Scents. Uniquely Local Ingredients & Aromas for Bar Soap & Other Bath Goodies. Images by Kuhdoo Soap Co. While humans are not usually credited with the best sense of smell, we can appreciate an overwhelming array of aromas, and it should be no surprise that we seek out the most pleasant ones to enhance our lives. 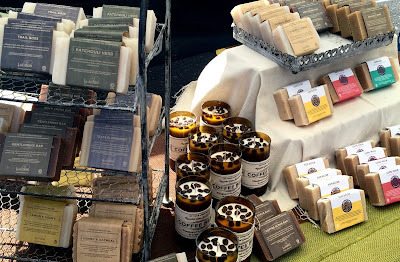 Thankfully we have crafters like the family team behind Kuhdoo Soap Co. that brings us wonderfully scented bar and liquid soap, candles and other small batch artisan organics to enjoy! Everything that comes out of the Kuhdoo "micro-factory" as they call it, is handmade with choice natural ingredients. They very lovingly combine all natural oils, milks, honeys, butters and not much more to make sure you only get what's good for your skin. The fragrance choices are probably their most unique element though. Kuhdoo is always coming up with new recipes, some that are simple and wholesome like Honey & Oat or Lavender & Honey while others are more out of the box... Who would have guessed that craft beer would pair so nicely with craft soap?! I'm not much of a drinker myself, but I thoroughly enjoy drinking up the aromas of their "Brew Bars" all based on local favorites - Austin Beerworks, 4th Tap, Hops & Grain. I don't know that I've seen a more clever collaboration that supports and furthers the success of two local businesses. It's not hard to see that Kuhdoo is a labor of love for this family and a gift to us all to savor! You can find the Kuhdoo Soap family at many Austin art events, and I highly recommend you do so you can sniff test all of their amazing candles and bars! Then you can ask your nose if they're worth all this fuss. You don't just have to take my word for it!